Karin Tag was born on February 17, 1969, in Frankfurt am Main, Germany. After finishing high school, she completed vocational training as a geological preparateur at the internationally renowned Senckenberg Museum in Frankfurt am Main. Her tasks at the museum ranged from preparation of fossils through management of archaeological sites in Germany. On a second educational and training path, Karin Tag also launched a successful career as a soprano (opera singer). She enjoyed her first success on the stage in oratorio performance at just 12 years of age. Her vocal training began at age ten at the music school in Bad Vilbel (next to Frankfurt/Main). Following the second educational pathway, she then switched to studying under associate professors at the Frankfurt University of Music and Performing Arts for training in opera. Karin Tag successfully trained her voice as a soprano with Professor Antonis Papaconstantinou and Professor Gunnel Tasch-Ohlson. At age 33 she ended her career as an oratorio soprano due to the birth of her two children. As a freelance artist, she now develops innovative, new music, influenced by various musical styles from international culture. She has produced several CDs and held numerous private concerts with great success. Karin Tag published her first book in 1994 and is now the author of an additional seven books. Her writing revolves around topics such as spirituality, alternative healing methods and fringe sciences. She has also published children’s books and poetry. In 2009, Karin Tag founded the Council of World Elders in which she unites the best representatives of indigenous peoples, who are leveraging and passing on their traditional knowledge to promote world peace and the recovery of our planet. The Council of World Elders is a non-profit organization devoted exclusively to world peace, preservation of cultures and environmental protection. The Council of World Elders now encompasses ten members from nine nations, as well as two additional honorary members and 13 global advisors from seven countries, including His Majesty the King of Ghana and His Excellency, the former President of Mozambique, Joaquim Alberto Chissano. 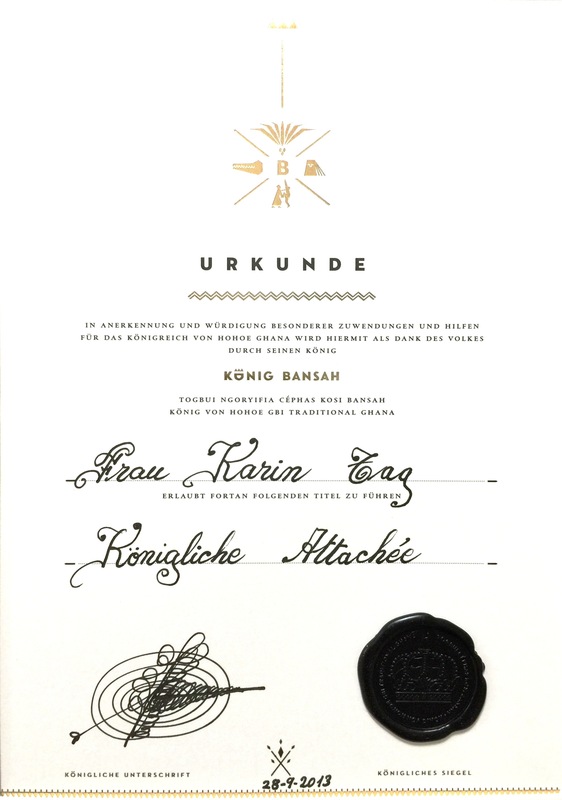 On an ethnological-political level, Karin Tag has received numerous awards for her international engagement to promote understanding within ethnological groups. Karin Tag has worked as a volunteer for various environmental protection organizations and humanitarian aid projects for several decades now. She received special acknowledgment when a wide variety of elders from different ethnic groups joined the Council of World Elders, which she leads to promote international understanding among people. In the past ten years, she has received additional honors from native peoples for her culturally unifying and peace-building political engagement, including an award from His Majesty King Togbui Chépas Bansah, King of Hohoe Gbi Traditional Ghana, for her humanitarian work in Africa. Together with celebrities such as internationally renowned singer Nina Hagen and star designer Harald Glöökler, Karin Tag is leading campaigns to protect indigenous tribes in the Amazon Rainforest. Through the Head Office of the Council of World Elders, Karin Tag organizes future-oriented congresses and conferences devoted to development of solutions for renewable energies as well as ethnic training and training to encourage environmental awareness among all peoples. As a speaker for international cultural projects, she works to preserve cultural goods and values and supports the founding of schools and educational centers. She received a personal blessing from Pope Benedict XVI in 2012. Her active engagement to promote understanding between peoples and world peace is always religiously neutral. For two decades now, she has been working towards peace while supporting worldwide peace-building projects from all major religions.